"We love to make these tacos in our pie irons over the open fire when we are camping. I think they are better than real tacos!" Cook the ground beef in a large skillet over medium-high heat, stirring to crumble, until browned. Pour off excess fat, and mix in the taco seasoning according to package directions. Spray the inside of a pie iron with cooking spray, and place a corn tortilla on one side. Place a scoop of ground beef on top of the tortilla, sprinkle with Monterey Jack cheese, and chopped onion. Finally, place another tortilla on top, and close the pie iron. Cook the taco over the moderate coals of a campfire until the tortillas have crisped and browned, and the taco is hot in the center. Serve with lettuce, tomato, salsa, and sour cream. Repeat with remaining ingredients. These were awesome. We always have a pie iron meal when camping and have tried many different sandwiches and treats but I have to say after having these, we have a new favorite. nice change from the same old camp pies i've had. i added refried black beans. This was yummy. We simplified it and only did the taco meat and cheese inside. Will definetely make again and bring extra to eat more and share. Thanks for the recipe. 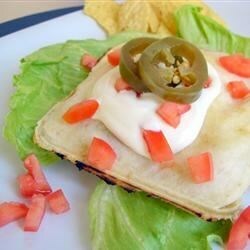 I tried these using plain bread instead of tortillas and they were really good. I didn't have any salsa so I just used ketchup.